Gripping tales and wonderful characters. Would love to see this developed into a TVs series. Following the publication of Holmes Volume 2: The Return of Boro’s Greatest Detective last month, the first feedback has arrived. It’s been very encouraging, and a bit of relief, to see the first people to throw their hat into the ring along with the maximum five stars. Especially as both of these gentlemen posted reviews for Holmes Volume 1. I say a relief because with Holmes Volume 1 receiving such good feedback, there was always the nagging worry that the follow up might not live up to its predecessor. If I’ve done the job I intended to, then Volume 2 should be a little more out there. 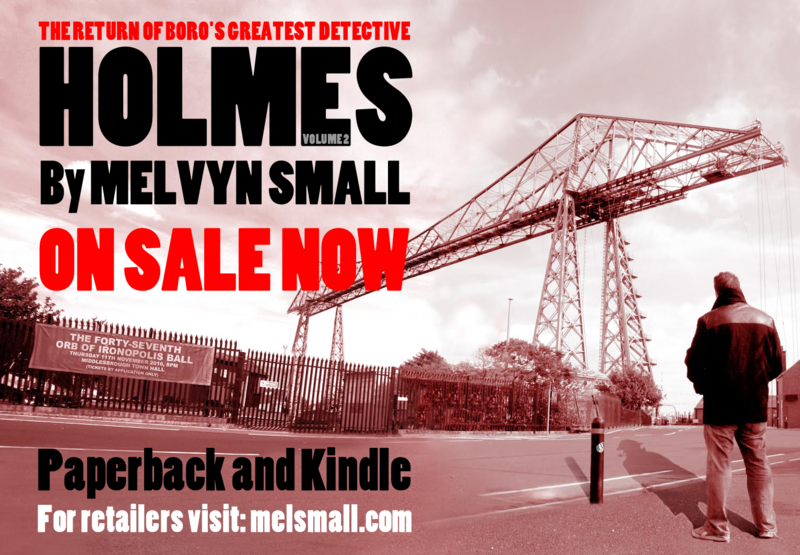 It’s difficult to explain but having apparently gotten away with a contemporary version of Sherlock Holmes, living, drinking and swearing in modern day Middlesbrough, I decided to have a little more fun with it. The result is Watson taking the lead in a few adventures, trainee assassins, secret societies and Holmes’ theory on dream mechanics and the age old question of love. When I set out on this epic, there was always the risk my Sherlock Holmes would not go down well with traditionalists. I have not found this to be the case. Fans of the original Holmes have liked it and some readers, who weren’t particularly fans of the original Sherlock Holmes stories, have enjoyed my contemporary version. I can’t take much credit for this as there’s no getting around the essence of the character firmly belonging to Sir Arthur Conan Doyle. Mel has excelled with his second novel. Gripping tales and wonderful characters. Would love to see this developed into a TVs series. Keen for the next volume. "He lived in a ratty little flat, had no car, hardly any clothes and few friends, but in his mind he traveled the universe." This quote about Holmes is the underlying thesis of the novel. It's true that Holmes and Watson do solve cases in the story, but Small cleverly weaves the disorderly mind of Holmes into its very fabric. Holmes and Watson are cleared of bank theft, they find the missing Orb, they clear up old cold cases and Holmes suffers a mental breakdown. But the biggest foe is The Professor and ultimately Holmes' most dangerous challenge. Mystery and suspense abound here, but it's Small's dry British humor that keeps you reading on. Many thanks to Neil and Richard for their postings and everyone else who have shared kind words with me.